Google on Tuesday announced intentions to bring its Fiber technology to both Chicago and Los Angeles. So long as city officials can agree to a roll out, residents in both locations could start enjoying the faster Internet speeds in no time; adding Los Angeles to the mix marks the fourth different city Fiber could be available in California. Who said having home court advantage doesn’t have its perks? As you can see in the Fiber map above, the rollout of Google’s Internet service is still in its infancy, but the search giant appears to be honing in on its next targets. There are still a lot of cities on the “potential” list; hopefully by this time next year the map is dominated by “current” Fiber cities. 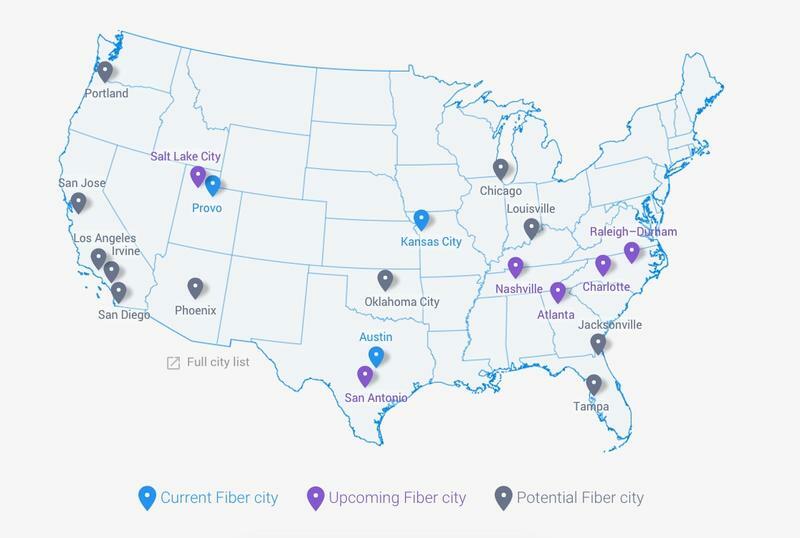 Other prospective Fiber locations include Irvine, San Diego, Tampa, and Portland. With the announcement of Chicago and Los Angeles as potential Fiber cities, Google is already making a case as to why residents would benefit from the faster speeds. Below are individual pitches for each city. In Chicago, fiber Internet will help bolster a fast-growing startup scene by fueling incubators like 1871, venture capital funds like Chicago Ventures and hundreds of small businesses. With the help of the city’s leadership, Internet speeds can help attract more tech talent and add to the 40,000 tech jobs that exist across the Windy city. In L.A., faster Internet may mean that indie musicians and YouTube stars can spend less time worrying about bandwidth, and more time creating their next project. The same goes for SoCal techies; just last month, L.A. TechWeek brought thousands together to discuss how tech can push the limits of fashion, healthcare and more. Rolling out Fiber to such large cities will not only help promote Google’s faster Internet across the U.S., but challenge the technology in denser metropolitan areas. Sure, areas like Austin, Provo, and Kansas City are big. But not Chicago or Los Angeles big. If Google Fiber does make its way to either city, residents could enjoy speeds of up to 1Gbit/s.